Are you missing teeth? Does it affect your confidence, eating your favorite foods and your social life? Advancements in dental technology over the past decade have made it confusing for patients to determine the best course of treatment. We hope this post will empower you with the facts needed to make the right decision when considering dental implants and other alternative treatments. When patients are not seen by a dentist for regular check-ups decay hides in between teeth and below the gum line and until the tooth breaks or becomes infected and painful, massive decay can go undetected for years. In such cases the decay is so deep a tooth needs to be extracted as a root canal is not a viable option to save the tooth. Below you will find the pros and cons of your options before making a decision on how to replace your missing tooth. Research provides that Twenty-Two percent of Americans have lost all of their teeth by the age of 65. Are among those who have resigned themselves to or are considering dentures? Also, when teeth are extracted the area of a missing tooth suffers from bone loss. Diminished bone structure has an impact on the way your face and mouth look. Collapsing of the cheek and mouth occurs when teeth are missing and there is no permanent support via dental prosthesis. Future implant placement is more expensive as bone grafting is needed to replace diminished bone structure to accept an implant successfully. Note: Mini-implants can remedy most problems associated with dentures by permanently affixing prosthesis. Another permanent solution for missing tooth is a dental bridge. The problem, it involves removal of tooth structure of surrounding teeth. Instead of restoring an isolated tooth, two perfectly good teeth will need to be significantly altered from their natural state to secure a dental bridge. 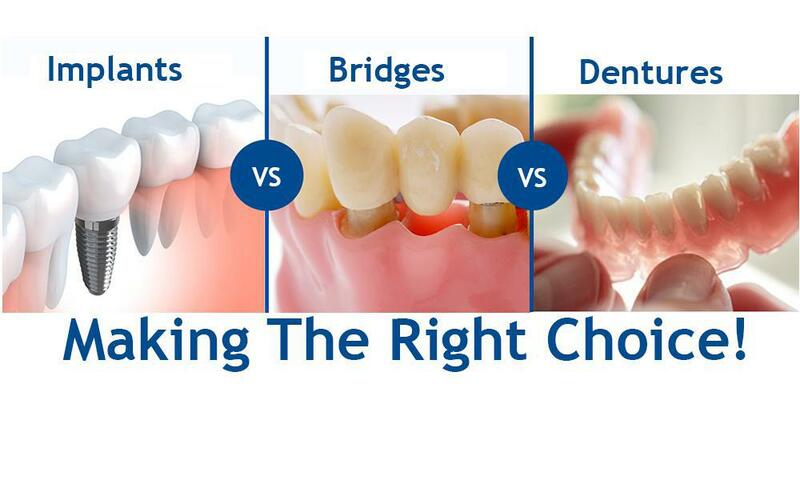 If dental bridges are not replaced every 7 to 10 years two or more teeth are now susceptible to becoming problematic. The upfront cost of choosing a bridge instead of a dental implant is significant but in the long run it is less expensive as a dental implant will last a lifetime. Many patients will opt for dental bridges instead of implants as it is recommended by their dentist. Please note that a dentist may treatment plan as it financially beneficial their practice. If a doctor needs to refer you to a specialist to place an implant, he will make less money than if he convinces you a dental bridge is your best choice. Ask your dentist why a dental implant is not a viable treatment. If you are questioning his answer, get a second opinion. If bone loss is extensive or your sinus cavity prevents the placement of an implant a dental bridge is your second best option. At Totowa Dental Center we believe that empowering our patients to achieve optimal oral health begins with patient education. We hope you will agree that dental implants should be your first choice when considering tooth replacement. Please accept this $600.00 Gift Card to be used toward your dental implant. If you would like to meet with one of our award winning doctors please contact us at 973-890-0600 for an implant consultation. We look forward to welcoming you to the Totowa Dental Center Family!